A pair of leaked images not only contain a live shot of the Moto Z3 Play, they also reveal a 5G Moto Mod that might eventually be offered to those with one of the modular Moto Z handsets. Just the other day we told you to expect the third-generation handset to be officially introduced on June 6th in Brazil. As for the 5G Moto Mod, we first told you that such an accessory was a possibility back in December 2016. While we would expect the 5G Moto Mod to offer next-gen connectivity to compatible handsets, no information about it has leaked. 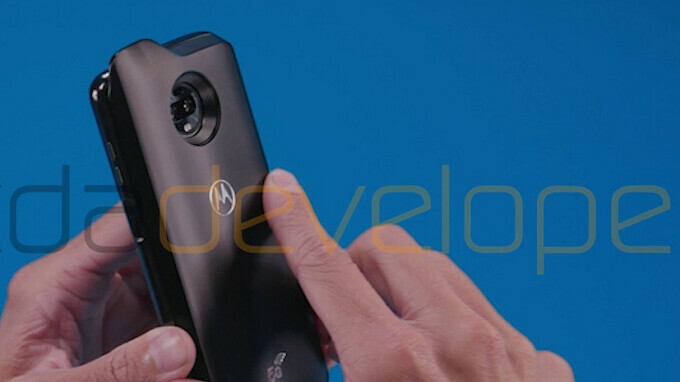 You can see that the 5G Moto Mod does appear to have an antenna on top. The Moto Z3 Play is expected to feature a 6-inch AMOLED display with a resolution of 1080 x 2160 (FHD+) and an 18:9 aspect ratio. Under the hood you will find the Snapdragon 636 mobile platform carrying an octa-core CPU running at 1.8GHz. Crunching the graphics is the Adreno 509 GPU. 4GB of RAM is inside along with 32 or 64GB of native storage. A dual camera setup is on back, and keeping the lights on is a 3000mAh battery. Android 8.1 is pre-installed. There is talk that the Moto Z3 Play will be one of the thinnest premium phones unveiled this year. One note. Just because the Moto Z3 Play has a pill shaped navigation bar at the bottom of the screen doesn't mean it is running Android P. While the second developer preview for Android P does feature a similarly shaped bar, on the Z3 Play this is just something that Motorola cooked up for its version of Android 8.1. We should hear more about the Moto Z3 Play, such as pricing and availability, when the phone is unveiled in 11 days. At the same time, hopefully we hear more about the 5G Moto Mod. It's like I'm looking at the Moto X Pure from 2015 or something. Haven't had much luck with series 1 unfortunately, series 2 seemed better. Hopefully third time around gets it right. old design imo though. G7 should be nice ...not thinQ ok !